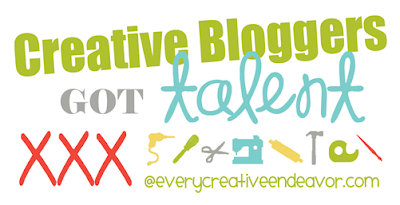 I'm in the Final 5 in Creative Bloggers Got Talent Competition over at Every Creative Endeavor! And I would LOVE your votes! I can't tell you which project is mine but I'm hoping if you've been following me for a while now you will possibly recognize stuff in the background. Congrats! I will be sure to vote for you! Thanks so much for hosting, Allison! Congrats on making it into the Final 5. Woo-Hoo!!! Thank you so much for hosting the party! Congrats on making it to the top 5!